Celebrating the year’s achievements and enjoying gatherings of family and friends is a major part of the festive season. But with celebration comes noise. The chatter of people in a concentrated area, music, excited children, even clanging kitchenware while cooking, eating and cleaning, all generate noise. For people with hearing impairment, communicating in these situations can be difficult and these events can be daunting, and even isolating. It can be much easier to follow conversations that you have initiated – knowing the topic being discussed and being familiar with the subject matter provides a great opportunity to engage and participate. Did you know that we sometimes have a subconscious tendency to mirror non-verbal signals such as posture, body language, facial expressions of people we are speaking with? You can subconsciously encourage others to speak clearly, use expressive body language (gestures and facial expressions) and maintain good eye contact, by exhibiting these qualities yourself. Filling in unheard gaps, concentrating on reading lips and interpreting body language and asking people to repeat themselves can be exhausting. Try not to fake-it though (nodding along, or laughing with others), as your responses may be off the mark and lead to awkwardness. When you are in a conversation, try and give your best effort to follow-it. Don’t be afraid to ask people to repeat themselves. It is important to give your ears and brain regular rests. Go for a wander outside, stand in-line at the bar, take a time out in the bathroom. This can help you recuperate and recharge for your next conversation. Keeping conversations short and changing conversations through mingling, can help your ears and brain reset and recharge. Hearing impairment is nothing to be ashamed of – studies show that 1 in 6 Australians have hearing loss and the proportion is increasing. When you are chatting with a group of people – tell them about your hearing loss. This can avoid misunderstandings and considerate and capable people will want to help by speaking clearly. Don’t be afraid to ask people to repeat themselves – you can do this in a pointed way to show you have been paying attention (eg. “what did you say the name of the resort was?”). If there is someone at the social gathering you feel comfortable asking to repeat parts of the conversation to you, stand or sit next to them. They can relay key messages, and you won’t need to interrupt the flow of group conversation by asking the speaker to repeat themselves. 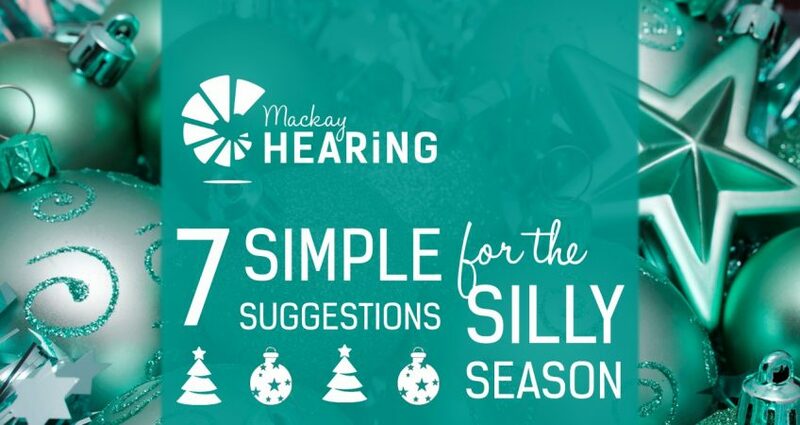 If you have hearing aids – wear them! Many modern devices contain features and settings that reduce background noise. Our Audiologist will be more than happy to discuss the capabilities of your device, as well as other communication strategies with you. If you believe you may have a hearing issue, and haven’t yet seen an Audiologist, contact us to arrange a hearing test. Hearing tests are non-invasive and pain-free and, after the test, you are free to consider your options. And finally, make sure that your communication expectations are realistic (even people without hearing loss miss parts of conversations) and remember to relax and enjoy yourself.